I searched for different seafood places in Manhattan and even considered having fresh fish delivered for convenience sake but $50 delivery charges was not worth it. A list of markets came up on Yelp but the results were not promising. Then, I remember a chef who once mentioned where he buys his fish and The Lobster Place inside Chelsea Market was his go-to place. I'm sure it's not the best place to get a good deal on seafood (tourist markups) but with the lack of options, I didn't care. They get their fish daily from the Bronx New Fulton fish market which I also considered but without a car and the lack of will to go fish shopping between the wee hours of 1-7 a.m. (Market hours), the Lobster Place was just fine. 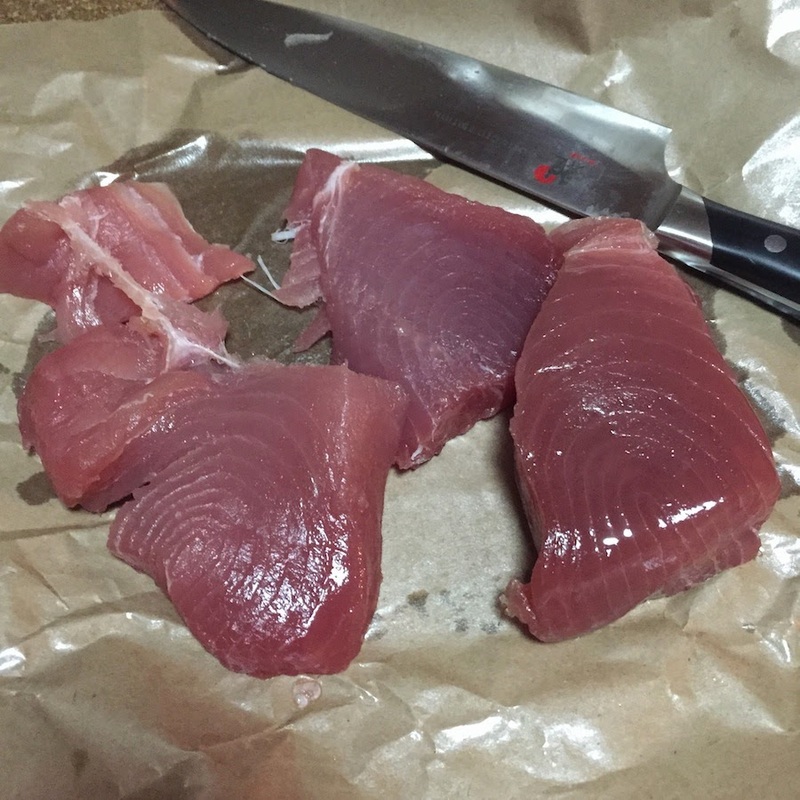 Great, so after calling and was assured that there will be fresh yellowtail (ahi) tuna on Dave's birthday, I planned my day to purchase the fish and prepare everything before Dave gets home after work. I bought about two pounds of fish for the two of us. I know we're gluttonous fatties and more is always better. I decided to go with both tuna and salmon. The tuna was $24.99/lb and the salmon was $29.99/lb (I also thought tuna would be a lot pricier than salmon?) and I also bought some seaweed salad to mix it in the poke. The total came out to less than if we'd go out for a fancy dinner so it was good. Here's what nearly one pound of fish look like. The Atlantic salmon was farmed. It was really tasty. 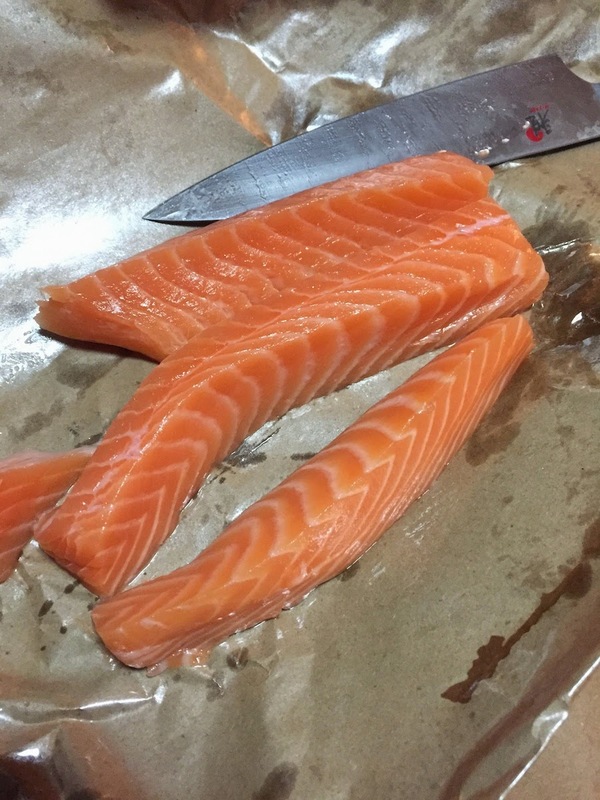 What one pound of salmon looks like.. The recipe is for approximately one pound of fish and loosely based on what's already out there. I recommend looking up a recipe and work from there but I'm going to share my recipe anyway. 3- Toasted sesame seeds. I purchased raw sesame seeds so I toasted a tablespoon of seeds on a pan for a couple of minutes before adding it to the fish. 4- Less than a teaspoon of freshly grated ginger. I don't actually don't know how much I used but it's up to you really. If you like ginger, then go for it! 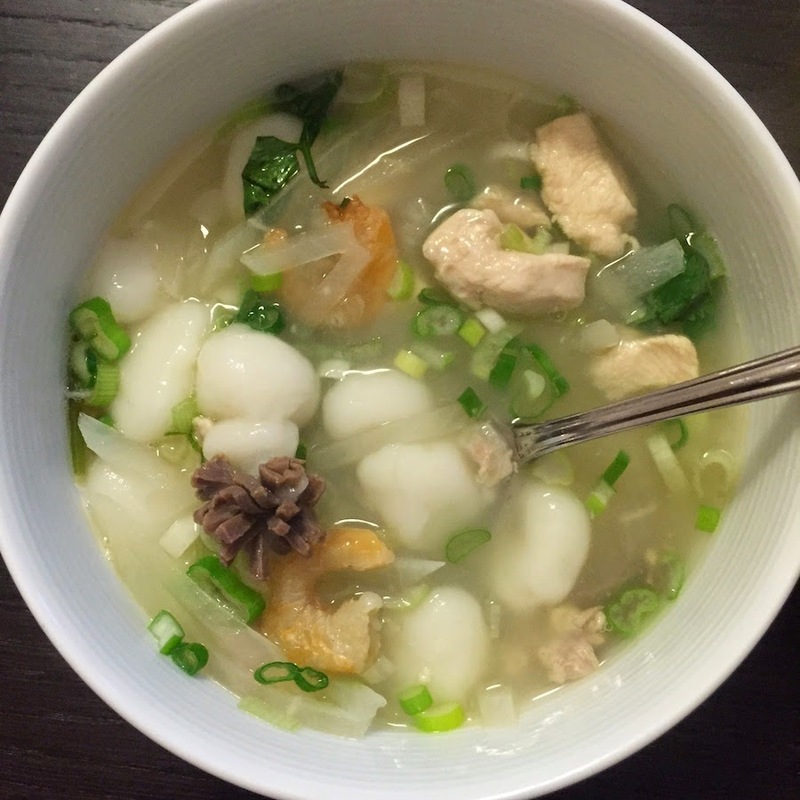 5-One cup of chopped yellow onions. I used both yellow and green onion. The yellow onions is strong so make sure you chop smaller pieces unlike what I did. 6-1/4 cup of chopped scallions. Keep both white and green parts. 6-Mix in a large spoonful of Pre-made seaweed salad. Optional. I diced up the fish into cubes (or as close as I can to cubes) and put it in a bowl with the diced up onions. I mix the soy sauce, sesame oil and ginger together before slowly pouring it onto the fish (I do this slowly and taste to make sure it is not too salty. Because if it's too salty, you can't go back unless you have more fish sitting around.) 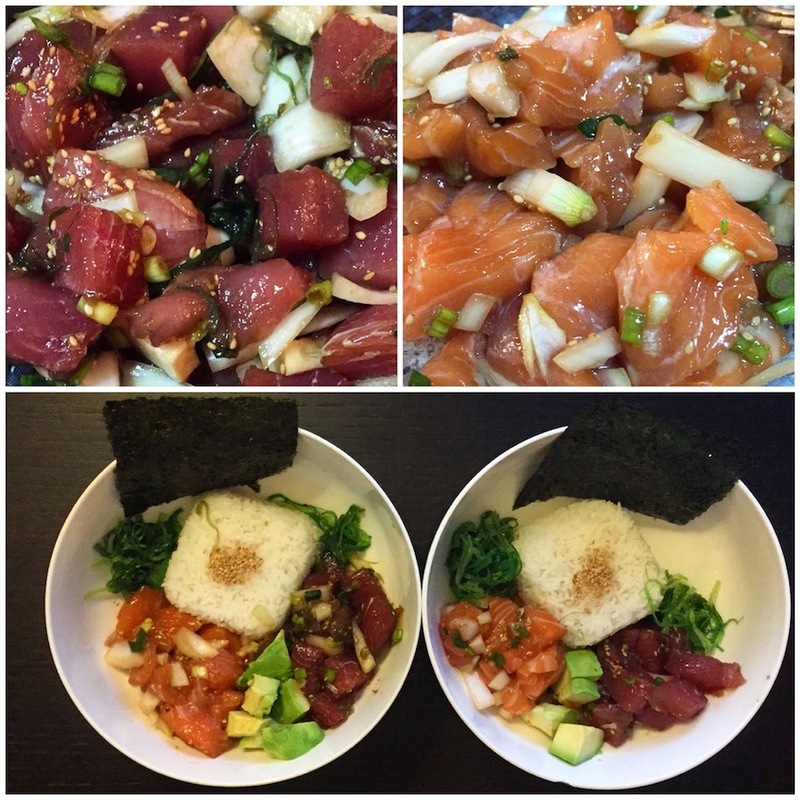 I mix in a small of amount of the seaweed salad but to the tuna only and not for the salmon. Then I add the sesame seeds and scallions until it looks like there is enough (i.e. pretty). I garnish with chopped avocado and dried seaweed. Oh I also squeezed a bit of lemon juice in the poke because I had a lemon around and thought it would keep the fish fresher for longer? For the birthday dessert, I opt for donuts instead of cake which I knew would surprise Dave because he would not be expecting it. He has a thing for donuts. His eyes glee at the sound of the word donut (and ice cream!) 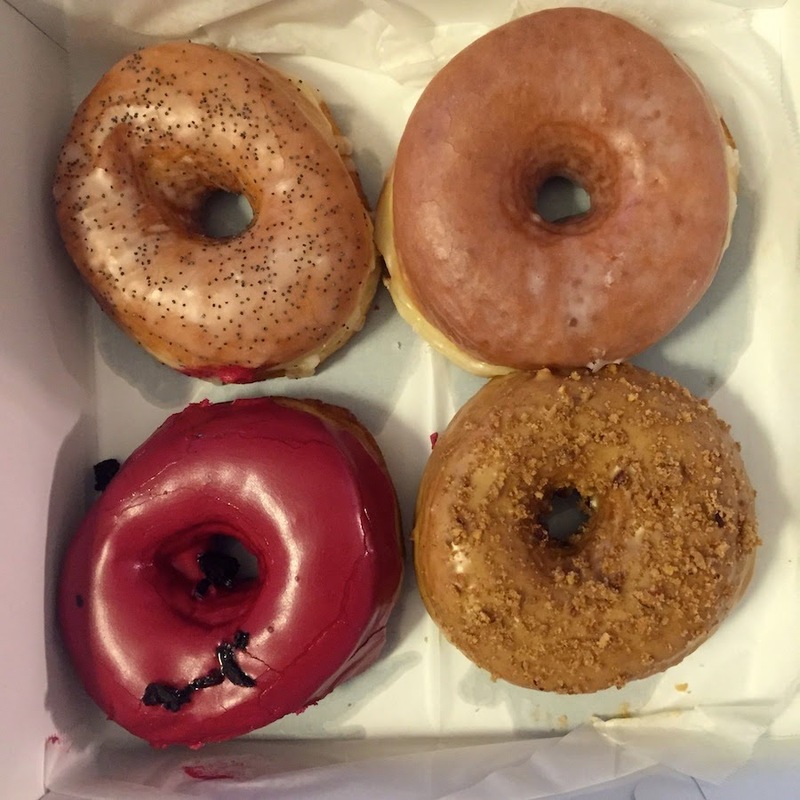 I visit Dough's new Flatiron location for the first time and picked up 8 large donuts. I called in advance to place an order in case the flavors ran out but when I got there for pick up, there was more than enough of everything for a party of 100. 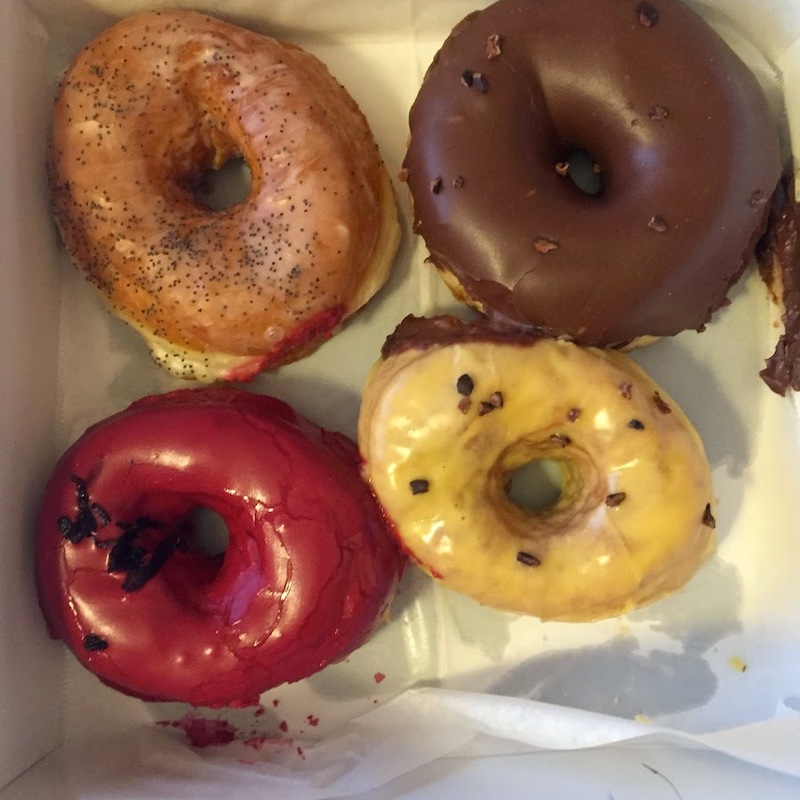 Flavors I picked: Lemon poppy seed, sugar glazed, hibiscus, chocolate with cocoa nibs, cafe au Lait (yum! ), passion fruit and a caramel-filled chocolate donut! I doubled up on some flavors in case Dave doesn't want to share (He always shares though..) He tasted all of them except the chocolate one because he was getting too stuffed. The next couple of days, Dave had doughnuts for breakfast, lunch and dinner. Bleurk. We ate the caramel filled donut the next day...Ooey gooey goodness! His parents made him 'tang yuan' just for his birthday which they brought for him at work. Aww. His parents are the best. I got to taste some of his birthday balls (That's what she said!) They were so good!